The village was founded by Son So (孫昭 1433-1484). The household of the Wolseong Son clan was placed on an auspicious site according to Korean theories of pungsu (geomancy). Son So and his wife, the daughter of Yu Bok Ha had a daughter who married Yi Beon of the Yeogang Yi family. The marriage produced one of the eighteen sages of Korea, Yi Unjeok. The village of Yangdon has continued since its auspicious beginning in the 15th century. Although some of the village is unoccupied today, the overall the village has over 160 tile-roofed and thatched-roof homes built throughout the dense forest. Fifty-four historic homes over 200 years old have also been preserved. The village preserves folk customs as well as traditional buildings of traditional Joseon dynasty architecture. Seobaekodang is the primary home of the Wolseong Son Family. Mucheomdang, is the primary house of the Yeogang Yi family. Hyangdan is National Treasure No. 412. Ihayangjeon and Simsujeong pavilions, and the Ganghakdang village school are also notable structures of the village as well as Gwangajeong and Sonsoyeongjeong. Tonggamsokpyeon, a book printed on movable metal type and National Treasure No. 283, is also located in the village. A picture of the village as you enter it. Dugok Yeongdang (Folk Cultural Asset Material). The village follows the topography of the mountains and valleys and is shaped like an auspicious Hanja character. This arrangement has been carefully preserved. The homes of the Wolseong Son and Yeogang Yu clans, as well as their descendants' homes are located on the high ground of the mountains and valleys. The lower-class homes, characterized by their thatched roofs were built on lower ground. The village's organization highlights the severe social stratification characteristic of Joseon dynasty society. Prince Charles visited Yangdong in 1993. ^ a b c 경주양동마을 慶州良洞─ (in Korean). Doosan Encyclopedia. Archived from the original on 2012-12-09. Retrieved 2009-08-17. ^ "손소(孫昭) - 한국민족문화대백과사전". encykorea.aks.ac.kr. ^ "Treasure No. 411". Archived from the original on 2007-09-30. Retrieved 2006-07-06. ^ "National Treasure No. 412". Archived from the original on 2007-09-30. ^ "Treasure No. 442". Archived from the original on 2007-09-30. Retrieved 2006-07-06. ^ "Treasure No. 1216". Archived from the original on 2007-09-30. Retrieved 2006-07-06. ^ "National Treasure No. 283". Archived from the original on 2007-03-14. Retrieved 2006-07-06. ^ "No. 73". Archived from the original on 2007-09-28. Retrieved 2006-07-06. ^ "No. 74". Archived from the original on 2007-03-14. Retrieved 2006-07-06. ^ "No. 75". Archived from the original on 2007-09-30. Retrieved 2006-07-06. ^ "No. 76". Archived from the original on 2007-09-30. Retrieved 2006-07-06. ^ "No. 77". Archived from the original on 2007-03-14. Retrieved 2006-07-06. ^ "No. 78". Archived from the original on 2007-09-30. Retrieved 2006-07-06. ^ "No. 79". Archived from the original on 2007-09-28. Retrieved 2006-07-06. ^ "No. 80". Archived from the original on 2007-09-30. Retrieved 2006-07-06. ^ "No. 81". Archived from the original on 2007-09-30. Retrieved 2006-07-06. ^ "No. 82". Archived from the original on 2007-09-30. Retrieved 2006-07-06. ^ "Monuments No. 8". Archived from the original on 2007-09-30. Retrieved 2006-07-06. ^ "Folk Material No. 34". Archived from the original on 2007-09-30. Retrieved 2006-07-06. 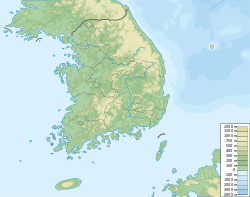 ^ "Gyeongju Yangdong Village". VisitKorea. Retrieved 2013-09-09.